This recipe is leaving me stymied. Is it complete? It sure seems like something is missing, however perhaps that is due to the way the cook wrote her notes to herself. Reading the recipe aloud it makes a bit more sense. I will add my interpretation below the recipe. The top may be like a crazy crust or cobbler. Not having made this yet, I can’t really be sure. Any input from readers is greatly appreciated. Make like pie crust. Spread 1/2 in 9×13 pan. Add pie filling then rest of mix. Bake 375 – 30 min. Mix flour, sugar, margarine & coconut, then divide in half. Spread half of the mixture in the bottom of a 9×13 pan. Add cherry pie filling, then top with the remaining dough. Bake at 375 for 30 minutes. Oooh, it sounds EXACTLY like cobbler or betty. Bet it tastes pretty good too, and nothing seems to be missing, except for maybe a little almond extract but that’s just my preference. Have you tried it yet? 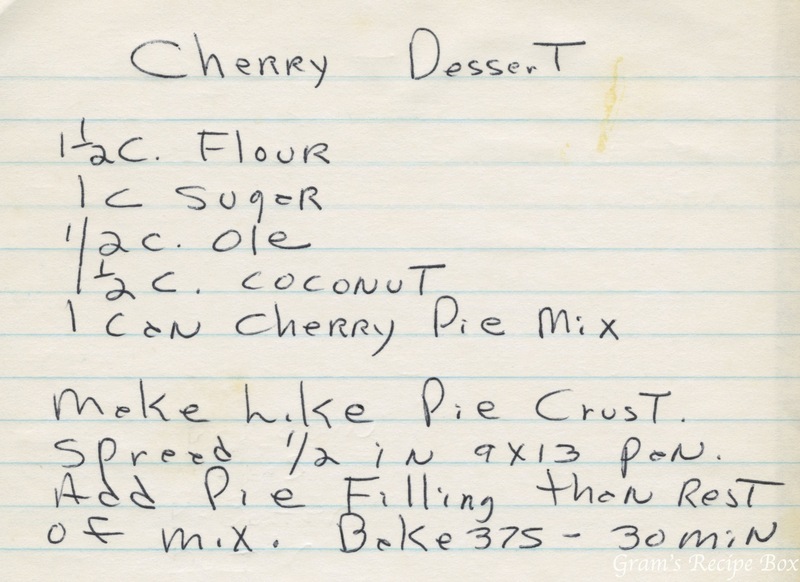 I wonder if I still have any cans of cherry pie filling from my days as a grocery rep? If not I may have to stop off at the store and get some. I haven’t made this one yet, but if you do you must share pictures with me! I would guess you combine all the ingredients except the cherry filling. It will probably be crumbly, then you would press half of the crumbs into baking dish, top with cherry filling and sprinkle or crumble the reserved crumbs over the cherry filling and bake ??? It does sound yummy, and yes almond extract is a must!